In early May 2013, Gmail introduced quick actions, which allow users to perform actions in their inbox without needing to open emails first. 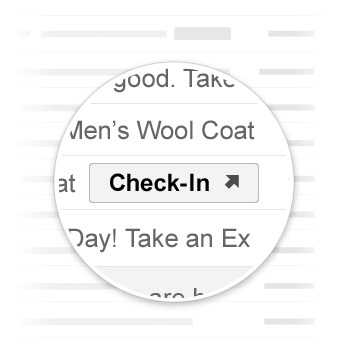 Gmail currently supports four types of actions, as well as one interactive card. 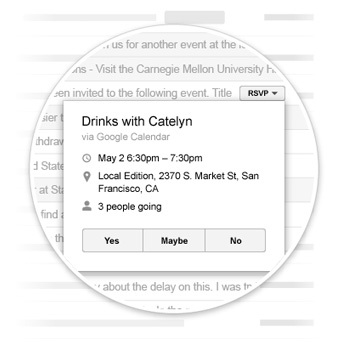 One-click RSVP Actions show an event’s details along with Yes/No/Maybe responses. 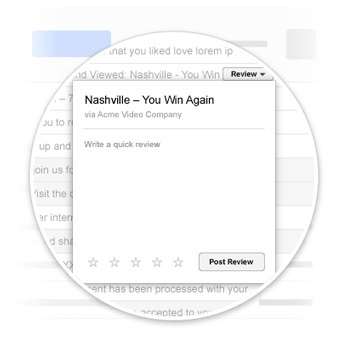 Review Actions are ideal for restaurants, movies, products, and services reviews. Not only can users give a starred review, but they can leave text feedback as well. 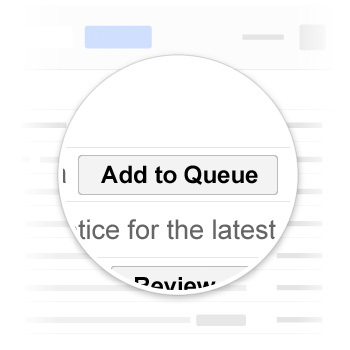 One-click Actions are great for simple calls-to-action that can be completed directly within Gmail, such as registration confirmations. Go-to Actions are a nice option for more complicated calls-to-action that take a subscriber to a landing page. Flight Interactive Cards are great for flight check-ins, updates, cancellations, and more. Examples of quick actions include reviewing restaurants you’ve ordered from on Seamless, modifying OpenTable reservations, and viewing YouTube videos, among others. Google is continuously adding support for additional actions. Adding a quick action to your email is easy. By including a JSON script, or schema, in the header of your email, you can start converting Gmail users quicker than ever. While you can test quick actions by adding schemas to your email and sending them to yourself (you’ll need to send and receive the email from a @gmail.com address), launching to the public requires registration with Google, DKIM or SPF authentication, and adherence to some email best practices. In addition, Google requires that quick actions "should be used for transactional mail where a high interaction rate is expected. They should not be used on promotional bulk mail." In this example, TripIt utilizes quick actions on triggered emails notifying users that a new itinerary is ready. Having a quick action for emails like this makes perfect sense—there is no reason for a subscriber to open the email because they already know where the action will bring them; they do not need additional details within the email. However, a promotional bulk mailing, such as an email from a retailer promoting a sale, wouldn’t be a good option for quick actions. Users would want more details about the sale itself before clicking through to the landing page. Calls-to-action (CTAs) that require additional information or context are better placed within the email! While many feared that they could affect open rates, quick actions are a great opportunity for email marketers. The potential to offer direct access to conversion opportunities without users needing to open emails is revolutionary. It’s a win for Gmail users and senders alike: a quicker path to conversion for marketers and less hassle for those with overburdened inboxes. However, it should be noted that if you decide to implement quick actions, you may notice a drop in your traditional email stats, like open rates. But, on the plus side, your conversion rates may go up! It’s the perfect thing to test. If it makes sense for your business, use quick actions to your advantage. Be sure to only use quick actions for calls-to-action (CTAs) that are clear and not ones that need the context of additional text—you don’t want to confuse your subscribers!